5 cross-screens for 3 who cuts to the short corner. 2 ducks in on the weak side, 1 passes to 3, 4 downscreens for 2, 3 passes to 2 for a shot. Hoop Tactics - Base pinch - 5 and 2 set screens for 3, if 3 uses 5, 4 downscreens for 2 (shown) or optionally 2 backscreens for 4 (see below if 3 uses 2). See Inbounds - baseline Duke series, 3 across, also Spain high-low. 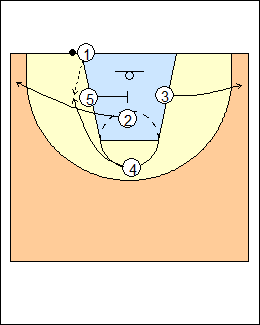 Can run "floppy" action (single-double) with 1 as the runner and 3-4-5 as screeners. See Izzo special, Single-double, Bologna, Ashbury (shooter). If X3 is facing 3, 1 lobs it to the rim. 3 should make eye contact and raise his eyebrows to signal for the lob. 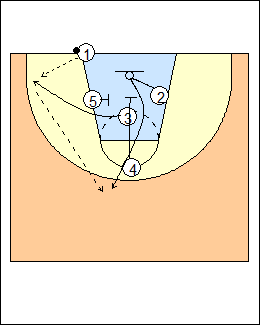 Hoop Tactics - if X3 faces 3 with his back to the inbounds passer, 1 looks to make a lob pass to 3. Chris Oliver - read the sleepers, automatic reads when the defence makes a mistake, e.g. - a direct pass to the weakside corner for a 3-point shot. Hoop Tactics - if 3 uses 2, 2 uses 5, 1 looks for 3 and 2, 4 downscreens for 3, or 3 backscreens for 4. 3 rejects 5's screen, a good play with one second on the clock because teams will usually switch all screens late in games. 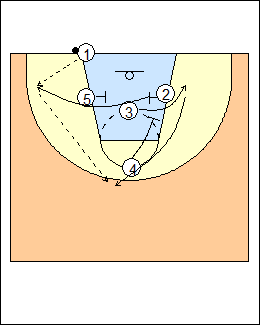 See Inbounds - sideline Fraschilla. 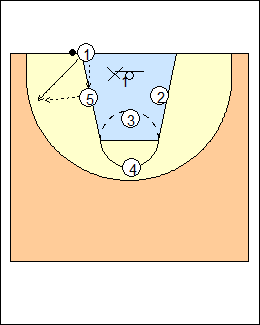 Used if X1 is under the basket, 1 passes to 5 and runs inbounds, 5 seals X1 and passes to 1 for a shot. Hoop Tactics - if X1 plays to the inside, 1 has the option of making a quick pass to 5 then stepping inbounds for a return pass. 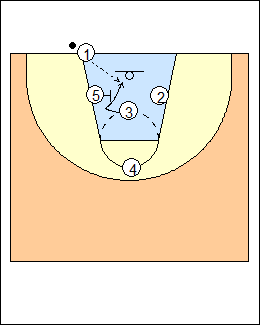 - if he is under the basket, run a play that attacks out (primary action to the ballside wing). 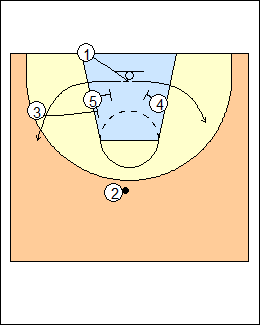 2 runs under 5 to the corner, 3 backscreens for 4 who cuts to the basket. 5 screens for 3 who cuts to the short corner. 2 and 3 cut to the corners, 5 screens the middle zone defender, 4 cuts to the hole in the zone. See Stack 3, Jayhawk, Corners, Gretzky.